Outgoing Alderman Terry Kennedy, D-18th Ward (center, in tie), stands with his family on Monday after being recognized at the St. Louis Board of Aldermen for 31 years of service. 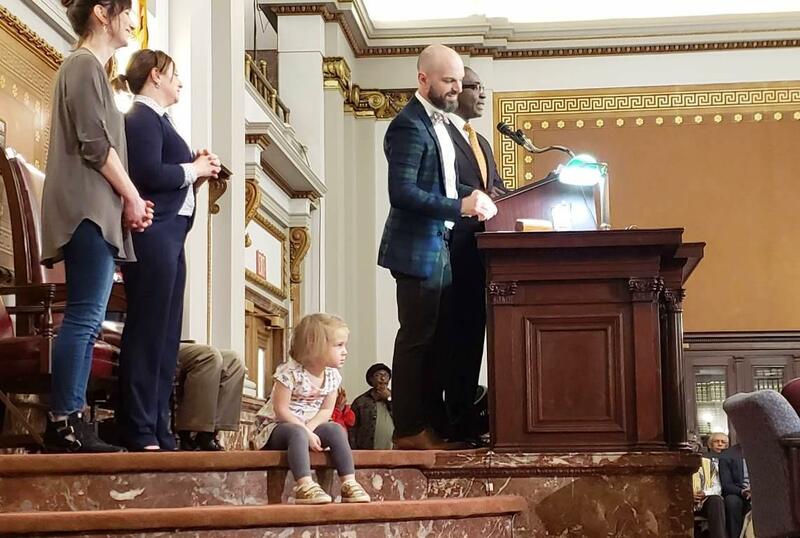 Members of the St. Louis Board of Aldermen on Monday recognized two colleagues who came to the chamber in different ways yet left their mark on the institution and the legislation it passed. Terry Kennedy, D-18th Ward, stepped into his father Samuel’s seat 31 years ago, then won re-election eight times. Scott Ogilvie, D-24th Ward, won his 2011 election as an independent after the Democratic incumbent lost to a former alderman who had been recalled. He ran for re-election in 2015 as a Democrat. The two men were very different personality-wise. Ogilvie spoke frequently on legislation — especially bills related to development — often standing at the microphone with his hands on his hips. Kennedy rarely spoke, and when he did, you could hear a pin drop in the chamber. On Monday, Kennedy had words of praise for his younger colleague. Mara Ogilvie listens as her father, Alderman Scott Ogilvie, D-24th Ward, addresses the chamber Monday, his last day as alderman. Moments later, it was Kennedy enjoying the praise of colleagues as he wrapped up decades of service to the 18th Ward, which straddles Delmar just north of the Central West End. Alderman Shane Cohn, D-25th Ward, was the first openly gay person elected to the board. Kennedy, he said, was the first person he felt comfortable talking to about issues facing the LGBTQ community. “Oftentimes in our society, there’s buzzwords of diversity or inclusion or equity. Alderman Kennedy lives those values every single day,” he told the chamber. But he was also a student of history, especially that of his own family and how it shaped him. Kennedy will remain at the board as its first African American clerk. Ogilvie has not yet announced his future plans. St. Louis Alderman Terry Kennedy is the latest guest on Politically Speaking, where he spoke with St. Louis Public Radio’s Jason Rosenbaum and Rachel Lippmann about his 30-year tenure on the Board of Aldermen. Kennedy represents the 18th Ward, which takes in nine neighborhoods in central and north St. Louis — including the Central West End, Vandeventer and JeffVanderLou neighborhoods. He’s planning to resign in early January to become clerk of the Board of Aldermen. It looks increasingly likely that St. Louis voters will see two tax-related measures on the April ballot. In a rare Monday meeting, the St. Louis Board of Aldermen gave initial approval to a proposed half-cent increase in the sales tax. The second measure would direct the resulting increase in the use tax to a proposed Major League Soccer stadium near Union Station. St. Louis Alderman Scott Ogilvie returns to Politically Speaking to talk about the pressing issues before the Board of Aldermen — and why he’s decided to leave after the 2019 elections. Ogilvie represents the 24th Ward, which takes in six neighborhoods around southwestern St. Louis. That includes neighborhoods that encompass Dogtown, such as Cheltenham, Clayton Tamm, Franz Park, Hi-Pointe and Ellendale. On this edition of the Politically Speaking podcast, St. Louis Public Radio's Jason Rosenbaum takes a closer look at how young African-American politicians are making an impact after a judge found former St. Louis Police officer Jason Stockley not guilty of first-degree murder in the death of Anthony Lamar Smith. On the Trail: Kennedy hopes his aldermanic colleagues embrace a "paradigm shift"
St. Louis Alderman Terry Kennedy, known for his oratorical abilities, didn’t make intricate speeches or engage in tough questioning as his peers on the Ways and Means Committee repeatedly discussed proposed ballot issues to help fund a Major League Soccer stadium and fix up the Scottrade Center. More than 30 years of work by city aldermen and activists paid off Monday, as the St. Louis Board of Aldermen approved a civilian oversight board for the city's police department. Applause broke out in the chambers as President Lewis Reed announced the 17-8 vote. Two members voted present, and one alderman did not vote at all. Aldermen talk about chickens and emus for more than an hour and a half today. Though the age-old question remains unanswered (you know, the chicken-egg thing), it is certain that urban agriculture will not be expanding in St. Louis any time soon. The Board of Aldermen soundly rejected Scott Ogilvie's measure on Friday that would have boosted the number of backyard chickens allowed from four to eight, and let residents keep sheep, goats and emu on larger lots.